This has been a wild month. 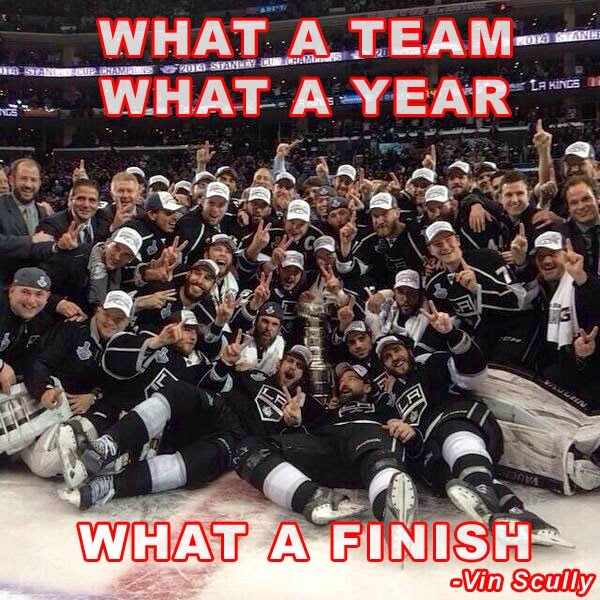 Not too long ago fans were ready to thrown in the towel. 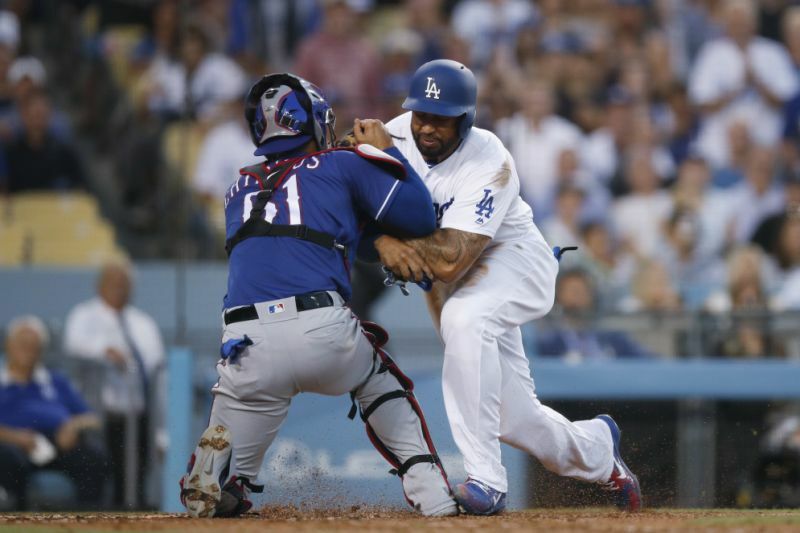 The Dodgers had gotten off to a terrible start to the season, so doom and gloom prevailed. Now, after slugging their 53rd homer as a team during the month of June last night (tying a club record), we find ourselves right in the thick of a division race. Best yet, Topps decided to commemorate the Dodger power surge by issuing a Topps Now card that makes note of two specific Dodgers' for being the first duo to hit ten or more home runs during the same month in franchise history. They are Max Muncy and Joc Pederson. See the card above and below. Go here to check it out and order. "I saw 100 percent from him," Dodgers catcher Austin Barnes said of Kershaw. 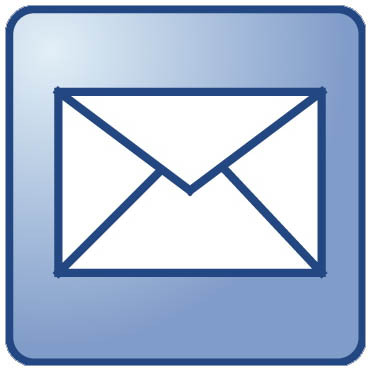 "I didn't see anything hampering or laboring or anything. I thought he was the Kershaw that I know." This Day in Dodgers History: In 1990 Fernando Valenzuela no-hit the Cardinals, 6-0, at Dodger Stadium. With 119 pitches he struck out seven and walked three. 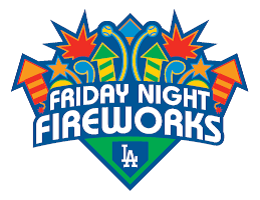 Also, on this same night, former Dodgers starter Dave Stewart threw a no-hitter against the Blue Jays; thereby marking the first time in modern Baseball history that two no-hitters were thrown on the same day. In 1995 Hideo Nomo struck out thirteen Rockies to give him a then team record of 50 strike outs in four consecutive starts. In 1996 Mike Piazza hit three home runs against the Colorado Rockies at Coors Field. 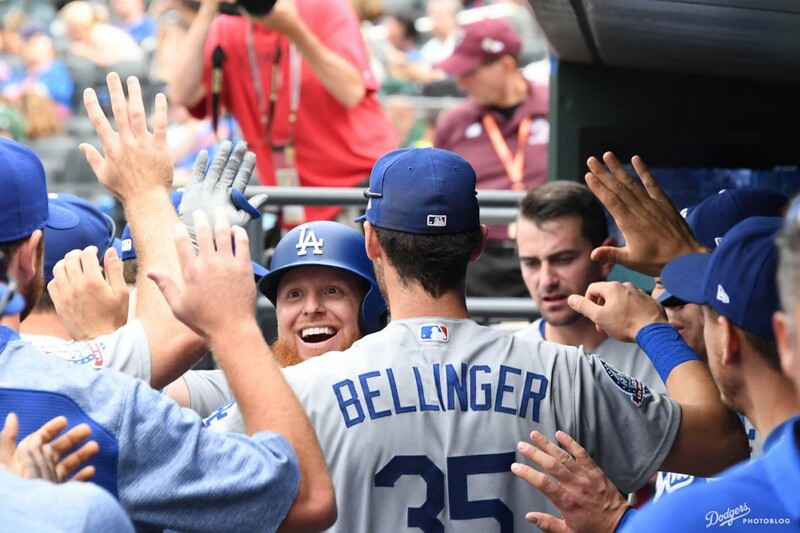 He became the fifth Dodger to hit three homers in a game. 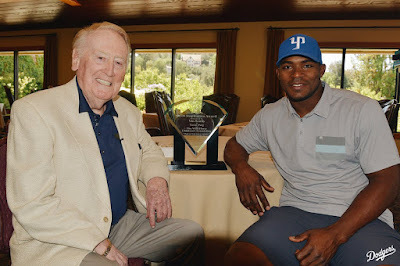 In 2012 the Dodgers signed amateur free agent Yasiel Puig. Happy Birthday, Wilbert "Uncle Robbie" Robinson, Farmer Steelman, Bobby Morgan, Rick Honeycutt & Pedro Guerrero! 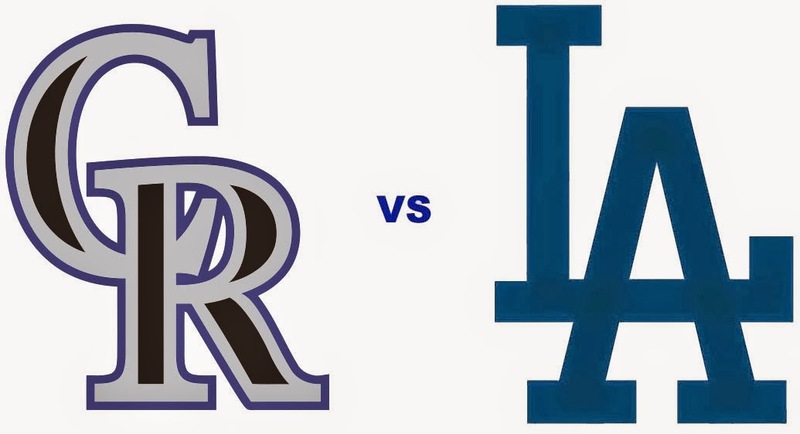 Rockies Series Starts Friday - Stadium Giveaways, Pregame Info and Other Stuff! 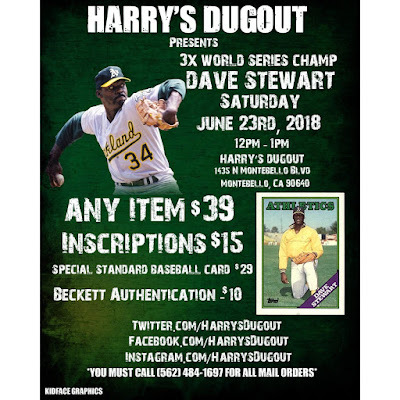 In addition to the release of Topps' Stadium Club brand, they also put out their mid-range Baseball brand called 2018 Inception this week. As you can see, they have a kind-of dark foreboding look to their design. 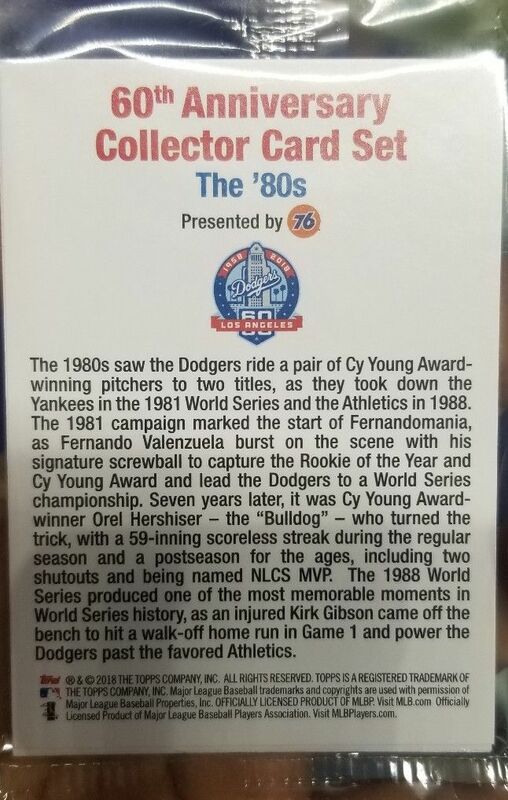 Within the 100 card base set are six Dodger players. Check them all out below. Go here for a complete checklist. Max Muncy, Joc Pederson and Cody Bellinger slugged homers last night to lead the Dodgers to victory over the Cubs, 7-5 (boxscore). 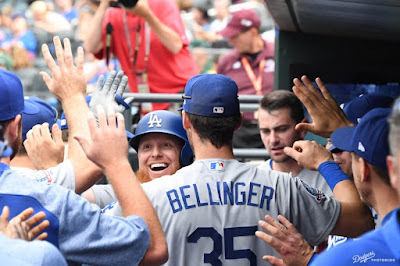 BTW, the Dodgers have hit 51 homers in June, and sit just two shy of a franchise record and seven short of the Major League mark. This Day in Dodgers History: In 1907 then Yankees catcher Branch Rickey (who would be known for signing Jackie Robinson decades later) saw twelve Senator runners steal a base on him. In 1969 the Dodgers and Don Drysdale shut down the Padres at Jack Murphy Stadium by the lopsided score of 19-0. 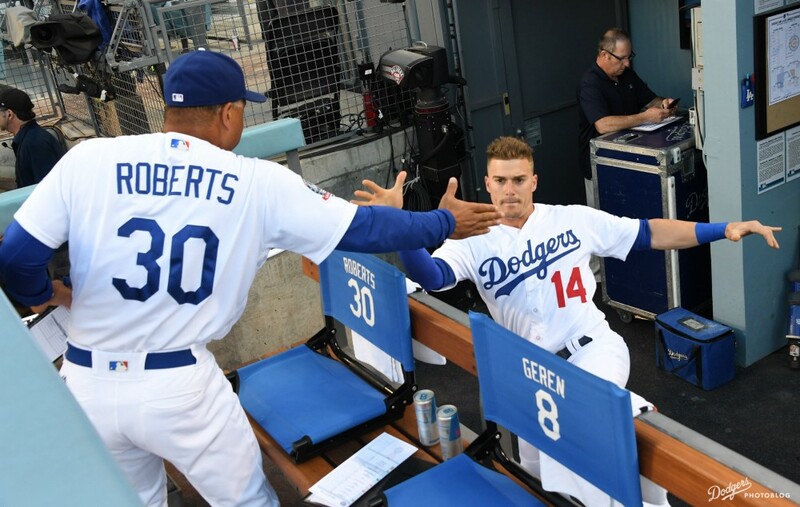 They break a LA Dodgers all-time record for runs scored in a game. In 2008 the Dodgers were no-hit by the Angels (Jered Weaver and Jose Arredondo), but still won the game, 1-0. The lone run was scored in the fifth inning when a couple of errors and a sacrifice fly by Blake DeWitt scored the eventual winning run. Happy Birthday, Fred Miller, Al Downing & Jose Flores! I'm not going to focus on yesterday's loss. It's water under the bridge. The most important item of the day is how South Korea helped out Mexico in World Cup play this morning. Wow! What an upset. This Day in Baseball History: In 1939 the Dodgers and Boston Braves/Bees play a 23 inning game that ends in a 2-2 tie. In 1980 Jerry Reuss throws a no-hitter against the Giants at Cadelstick Park, 8-0. He faces just 28 batters, and missed a perfect game due to an error by Bill Russell in the first inning. 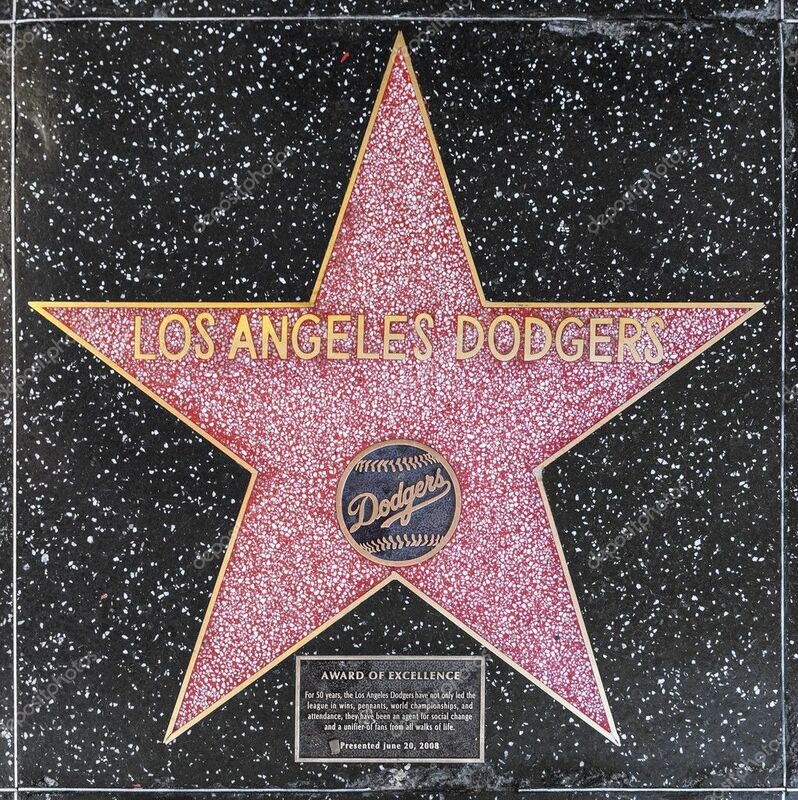 In 2011 the Dodgers file for bankruptcy following the leagues refusal to approve a multibillion-dollar TV deal with FoxSports. Happy Birthday, Jackie Hayes, Bull Durham, Hank Behrman, Wayne Terwilliger, Daryl Ward & Jim Johnson! This is probably my favorite non-flagship brand Baseball card set. 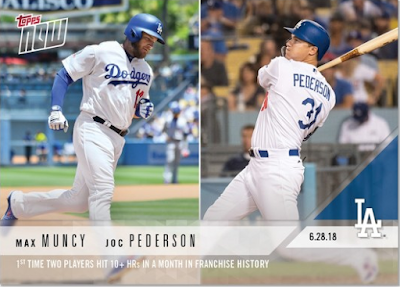 Featured below are all of the Dodgers' base cards found in packs of Topps 2018 Stadium Club. These boxes officially land in stores tomorrow, but singles are already showing up online. Go here for a complete checklist. The Stadium Club brand has a long history of using simple design elements to go along with a focus on fantastic photography, and this years set delivers on that. We've got everything from a Yasiel Puig "tongue" photo to a contemplative Joc Pederson at the dugout rails. 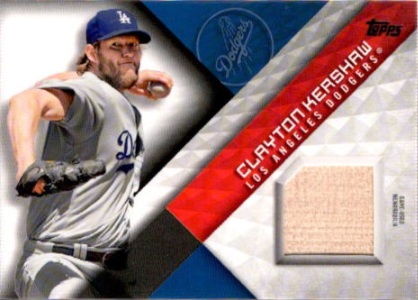 The best photo, though, is clearly the Clayton Kershaw card seen above. 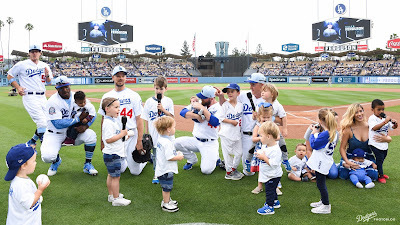 It features Clayton's two kids on the mound for a ceremonial first pitch with Kershaw playing the part of catcher. 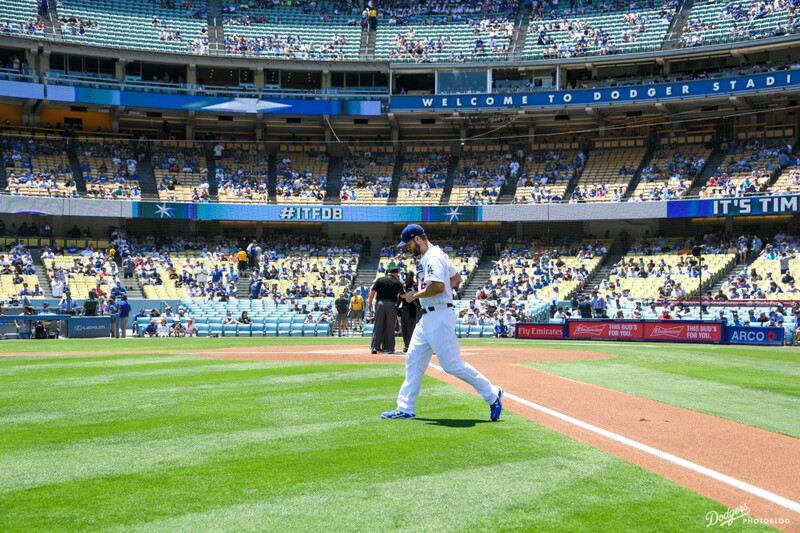 Better yet, the photo limits the depth of field by keeping the tykes in-focus while leaving Kershaw out-of-focus. We are obviously being told that the the most important subjects in the photo are his kids, and I suspect Clayton would tell you that's right. 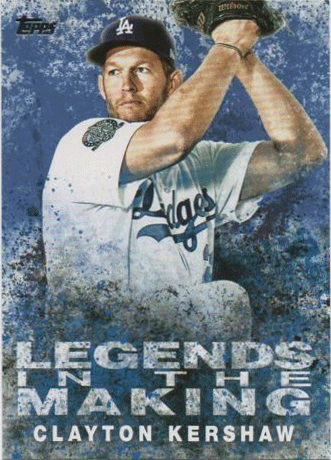 There are twenty Dodger base cards within the 300 card set. 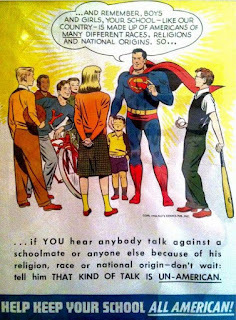 Take a look at all of them below. Furthermore, there are likely to be numerous photo variation cards, as well, so once they are all unveiled I will be sure to post about them. "So far, we're playing really good baseball," Hernandez said, "and we're looking forward to keeping it going." I'm looking forward to that, as well. "That's what we do. We hit homers." Kiké Hernández is definitely right about that. 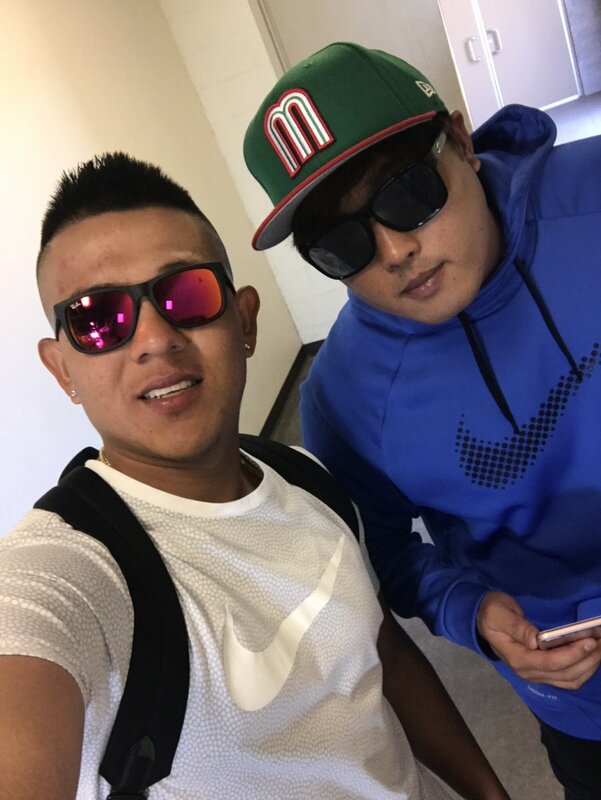 They hit seven solo home runs; including two each by Hernandez and Bellinger. 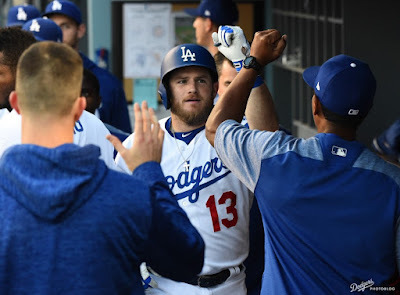 Pederson, Muncy and Turner also hit homers. Here is a look at the third 2018 Dodgers 60th Anniversary Baseball card set. This time it focuses on the 80's by using the Topps 1985 Baseball card design. 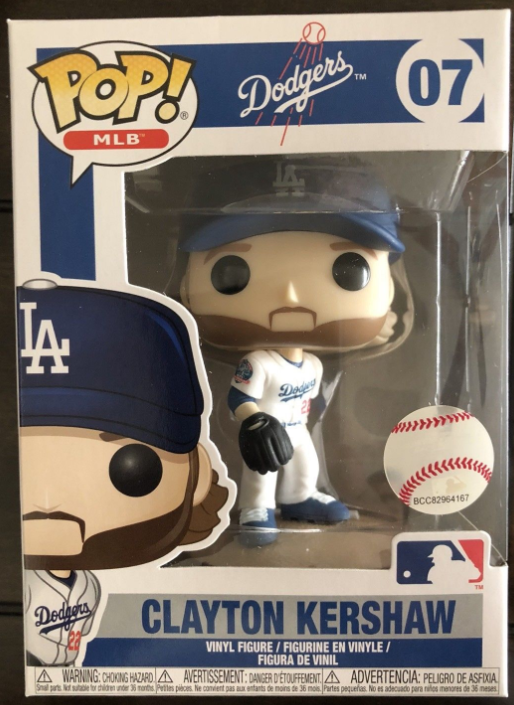 This set was given out to fans on Tuesday, May 8th during a game against the Diamondbacks. 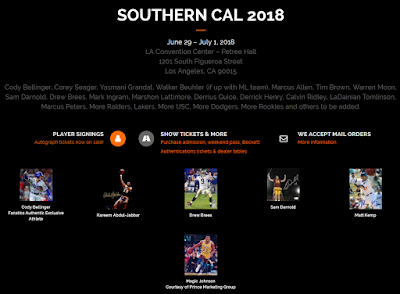 Just like in the prior two anniversary sets, this seven-card game-giveaway set includes the exact same first six cards of current Dodger players -- Bellinger, Turner, Seager, Jansen, Taylor and Utley. The seventh card, meant to represent a Dodger from the decade, features Hall of Fame manager Tommy Lasorda. 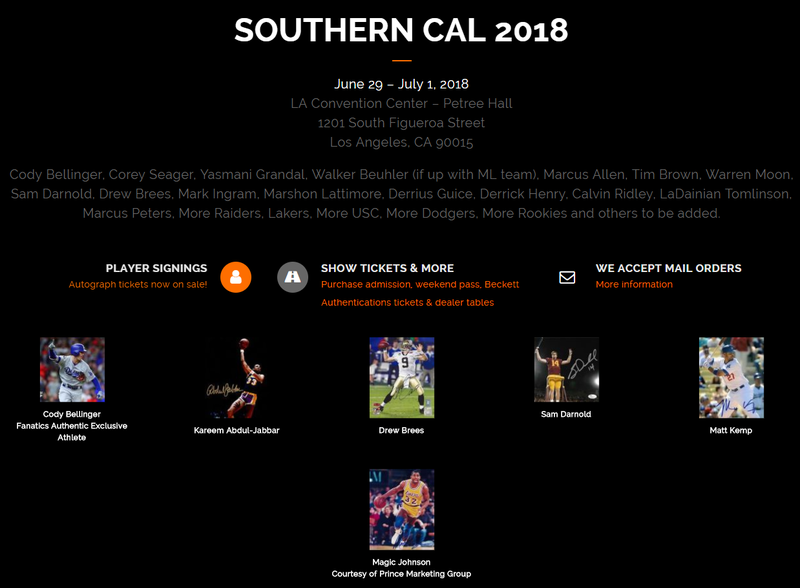 I was certain they'd chose Kirk Gibson (especially considering all the pomp of circumstance from opening week), so Tommy's selections is a surprise to me. 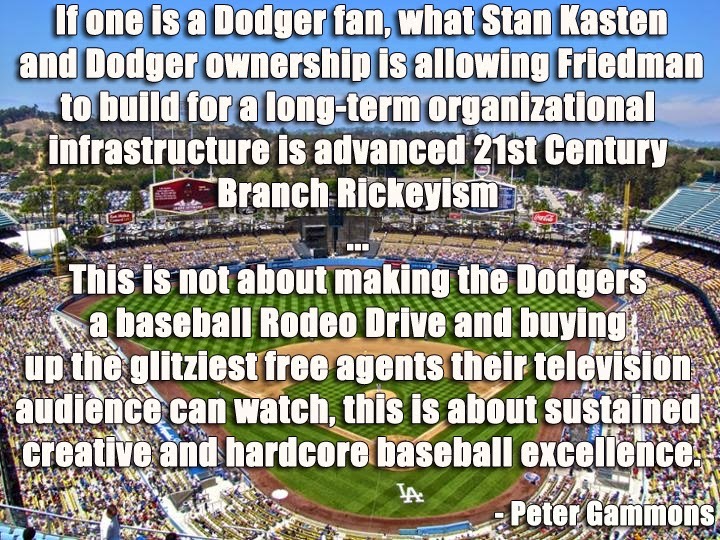 Furthermore, I would like to extend a shout-out and a word of thanks to fellow blogger and fanatic Dodger fan Andy from the Stadium Fantasium blog. He was kind enough to pass along this set for my collection. Take a look at the entire set below. 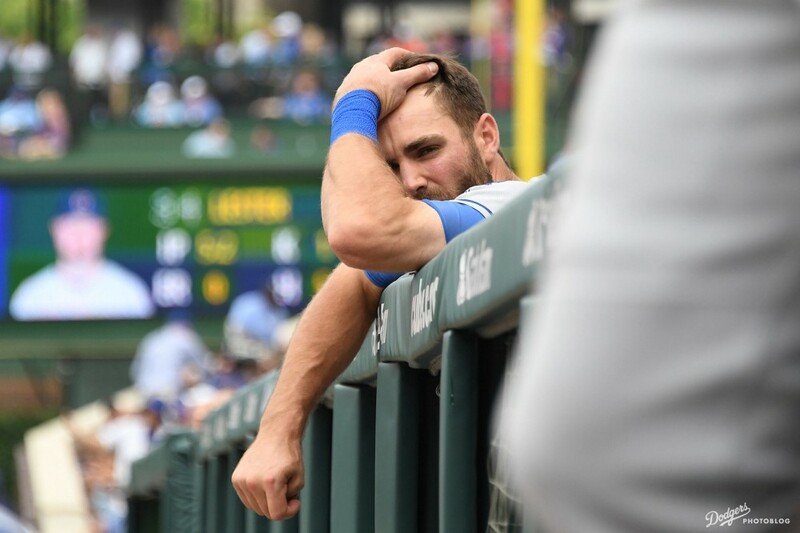 "I was just trying to hit the ball on the barrel," said Turner, who was 2-for-16 on the weeklong swing through Chicago and New York. "It's been a whole road trip of getting beat, getting jammed. What a day, a bunch of home runs and sweep a series against the Mets on the road. It will make for a happy flight going home." This Day in Dodgers History: In 1984 infielder Bill Russell played his 1,953rd game to become the LA Dodgers' all-time leader in games played. He would finish his career in Blue with a total of 2,181 games played -- second best all time in Dodger history. Hall of famer Zack Wheat best him with 2,322 games played as a Dodger. Happy Birthday, Barney White, Don Demeter, Alejandro Peña, Aaron Sele & Paul Maholm! 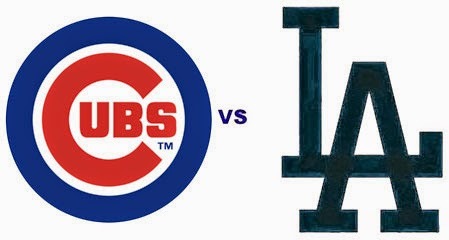 Cubs Series Starts Monday - Stadium Giveaways, Pregame Info and Other Stuff! 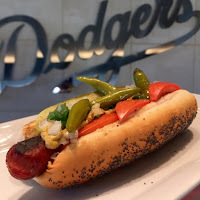 The Dodgers will be making the Chicago Dog at the On Deck Circle stand on Field Level section 48, Loge Level section 133 and Reserve Level section 4. It features an quarter pound of all-beef dog topped with Sport Peppers, Neon Green Relish, Diced Onions, Spicy mustard, Pickle Spear and Tomato Slices on a Poppy Seed Bun. 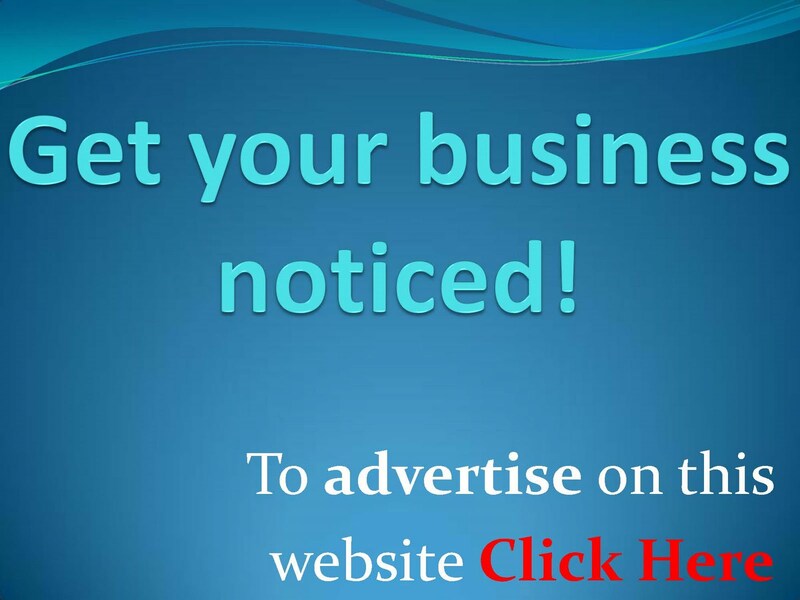 See it on the above right. Kenta Maeda vs Duane Underwood Jr. I made sure to leave the best for last. 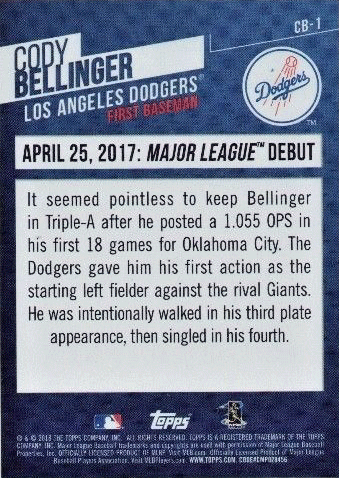 Featured here are pics of the epic 30-card Cody Bellinger Highlights set (both front and backs) found only in Target retail packs of 2018 Topps Series 2. 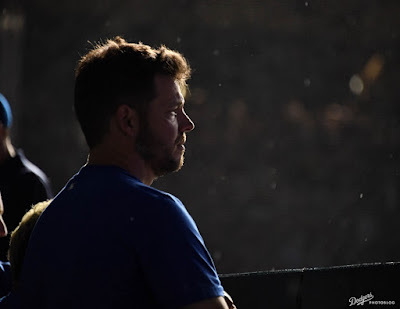 The set goes through his entire rookie campaign -- starting with his mid-season call-up to his selection as the National League Rookie of the Year. Clearly, this is a must-have for fans of Cody. Right now you can find individual cards being sold on eBay for just a buck or two, so completing a set can be done fairly cheaply. It'll just take some time and patience. Licensed stock broker and current break-out hurler Ross Stripling visited the NYSE yesterday. 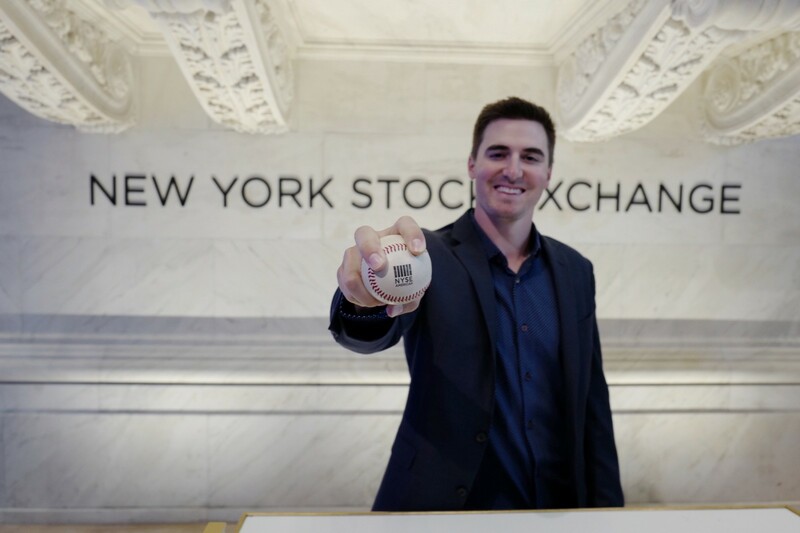 Check out his brief interview with Cheddar Live as he discusses his current investments, here. This Day in Dodgers History: In 1936 Reds outfielder Ival Goodman hit a three-run home run at Ebbets Field that lands and stays on top of the Schaefer Beer scoreboard in right field. Ballpark rules at the time dictate that it is still considered in play, so Goodman rounded the bases for the easiest inside-the-park home run ever. In 1947 Reds pitcher Ewell Blackwell, after having thrown a no-hitter his last time out, lost out on throwing a second consecutive no-no when Dodgers second baseman Eddie Stanky single with one out in the ninth inning. In 1959 Sandy Koufax struck out 16 Phillies batters to set a new record for strikeouts in a night game. "It wasn't a pull or anything, but after that play, there were a couple instances where it kind of grabbed. I don't expect to miss any playing days. If everything goes as planned, I think I should be in there." 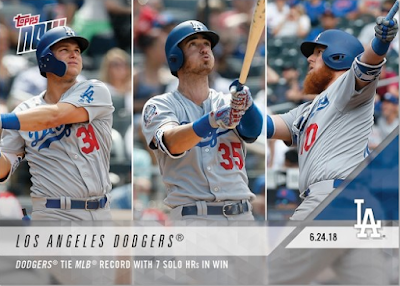 Here are the reminder of the Dodgers' Topps Series 2 insert cards found in packs -- with the exception of the 30-card Bellinger Highlight set that I plan to focus on tomorrow. Shown below are the 1983 Topps, Cut Signature, Future Stars, Instant Impact, Longball Legends, Own the Name Relics, Sketch, Home Run Challenge and Silver Pack Promotion cards. (Rich) Hill walked off the mound and let out a triumphant, cathartic yell. 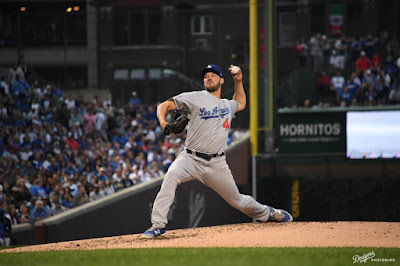 Hill left the game with a lead, one the Dodgers would lose along with the game 2–1, but it was a win in the sense that a vital Dodger starting pitcher came back strong and came out healthy. This Day in Dodgers History: In 1958 the Dodgers signed amateur free agent Willie Davis out of Roosevelt High School in Los Angeles. In 2000 the Dodgers traded infielder Jose Vizcaino to the Yankees for catcher Jim Leyritz. 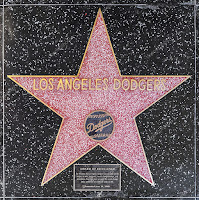 In 2008 the Dodgers are awarded the Award of Excellence star, which is placed on the Walk of Fame, for their significant contributions to the community by the Hollywood Historic Trust and the Hollywood Chamber of Commerce. In 2009 Dodgers pitcher Jeff Weaver best his younger brother Jered Weaver at Angels Stadium, 6-4. They become the eighth set of siblings to have started against one another. This past weekend Panini America celebrated the paternal bond with a child by making a promotional Father's Day set available to collectors at local hobby shops. With the purchase of various unopened product you would receive a certain number of Father's Day packs to open. There is a 74 card base set, and it includes stars and rookies from five major sports -- baseball, basketball, football, soccer and NASCAR. There are also a bunch of inserts to chase after. Go here for a complete checklist. Below is a look at all the Dodger cards available. 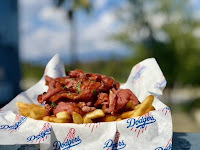 Blog Kiosk: 6/19/2018 - Dodgers Links - Double Header Today! It rained heavily for a while but the storm passed, the tarp was rolled up and preparations began to get the field ready for play. 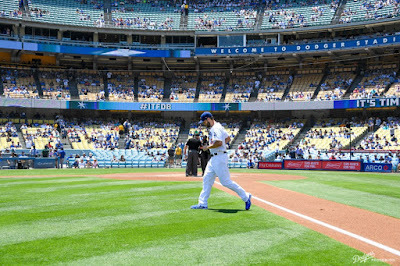 The fans settled back into their seats, including a large contingent of a Dodgers fan club who occasionally broke into "Let's go Dodgers!" chants. However, the light banks atop the right-field roof of Wrigley had gone dark, leaving that side of the park dark, as well as sections on the opposite side of the field that the lights would have been illuminating. The work on the field finished but the lights remained out. They will play a double-header today -- with the first game starting at 10:05 AM PST. Maeda will pitch the first game. Rich Hill will start game 2. 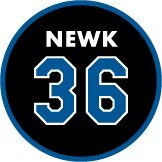 BTW, Alanna Rizzo is reporting, via twitter, that the Dodgers 26th man for today's double-header is Brock Stewart. He is currently at the stadium. This Day in Dodgers History: In 1952 Carl Erskine threw a no-hitter against the Cubs in the Dodgers' 5-0 victory at Ebbets Field. This is the first of two no-no's he would throw in his career. The only Cub to get on base was the opposing pitcher, via a walk. In 1973 Dodger outfielder Willie Davis collected his 2,000th career hit at Dodger Stadium with a two-run home run. In 1990 Dodgers catcher Gary Carter broke a National League record for career games caught at 1‚862. He passes former Dodger Al Lopez who set the record in 1946. Happy Birthday, Bill Swift, Larry Miller, Bob Aspromonte, Jerry Reuss, Butch Davis, Doug Mientkiewicz & Claudio Vargas! This Day in Dodgers History: In 1938 the Dodgers sign Babe Ruth to be their first base coach. He wears a Dodger uniform for the first time and took batting practice before the start of that days game (something he did prior to each game). In 1988 the Dodgers signed amateur free agent Pedro Martínez. 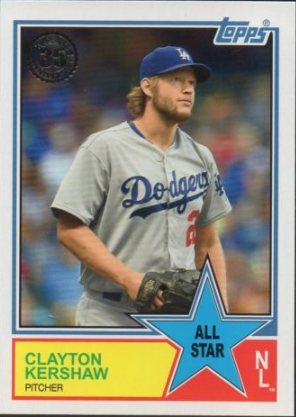 In 2014 Clayton Kershaw no-hit the Rockies at Dodger Stadium, 8-0. He recorded a career high 15 strike outs, no walks and missed a perfect game when Hanley Ramirez committed an error in the 7th inning. 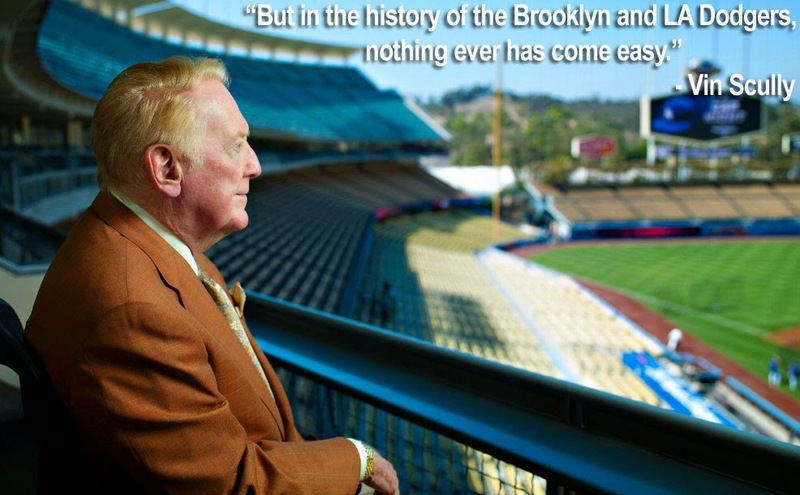 Watch Vin Scully's call here. 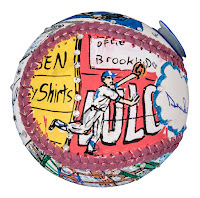 Check out this fantastic Duke Snider painted Baseball by modern-day pop artist Charles Fazzino. It is currently available on auction at Goldin Auctions (Auction Link). It features a Snider autograph to go along with drawings highlighting his career. On one panel you see Duke stretching for a batted ball in the Ebbets Field outfield. Another panel celebrates his induction into the Hall of Fame in 1980. 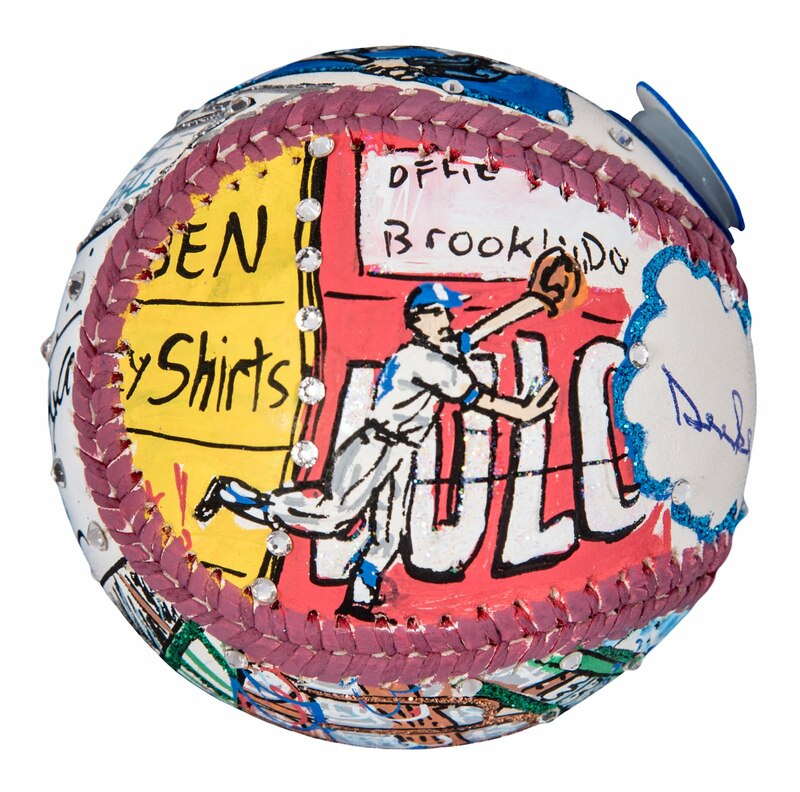 The more unique aspect of Fazzino's painted ball is how he incorporates a 3-D element into the Baseball. 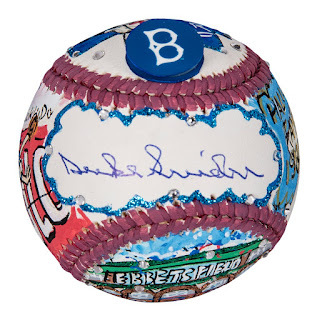 As you can see, the Brooklyn Dodgers logo "pops" out of the ball. Below are more pics showing the other panels. Currently, the ball has an opening price of $800 with no takers, so far. 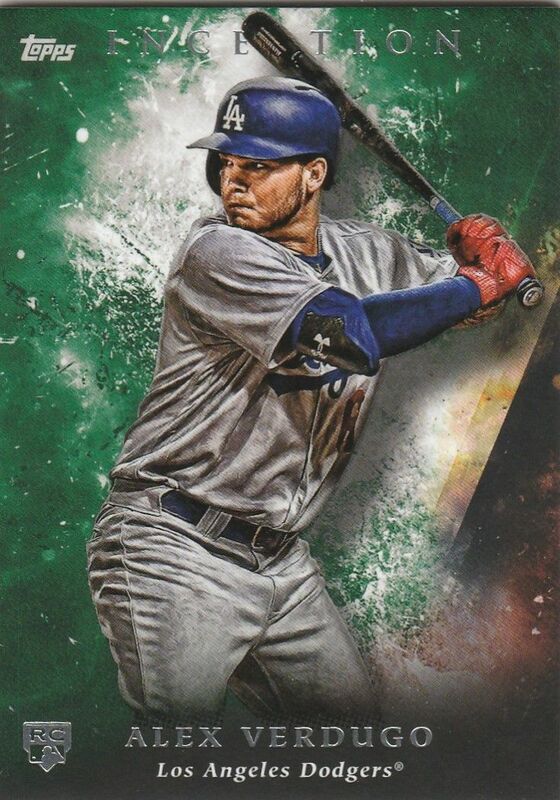 Now that you've seen the base cards, here is a look at some of the Dodgers' inserts you can find. Below are the Salute, Legends in the Making and MVP Medallion Relic cards. Prior to yesterday's Second Annual Poker Tournament sponsored by Puig's Wild Horse Foundation, Vin Scully present Yasiel with an 2018 Inspiration Award. This Day in Dodgers History: In 1938 Reds lefty Johnny Vander Meer made history when he threw his second consecutive no-hitter -- beating the Dodgers at Ebbets Field, 6-0. BTW, this was the very first night game played in New York City. In 1996 the Dodgers turn their first triple play in 47 years. In Atlanta with runners going from 1st and 2nd base in the 1st inning, Braves infielder Chipper Jones hit a popup to short-left that was snagged by Juan Castro. He dutifully threw to second baseman Delino Deshields for the second out, who then relayed the ball to first baseman Eric Karros to get the third out (6-4-3 Triple Play). 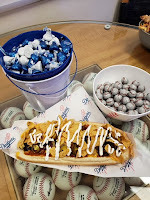 Happy Birthday, Ed Wheeler, Eddie Pipgras, Hank Winston, Babe Dahlgren, Dusty Baker, Brett Butler & Josh Lindblom! 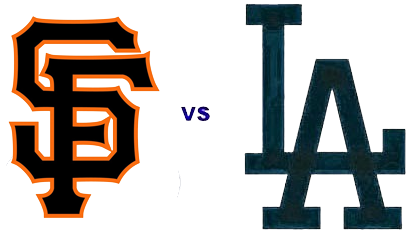 Giants Series Starts Friday - Stadium Giveaways, Pregame Info and Other Stuff! There are three new food items being made available for this entire homestand, and they are available at the On Deck Circle stand on Field Level section 48, Loge Level section 133 and Reserve Level section 4. 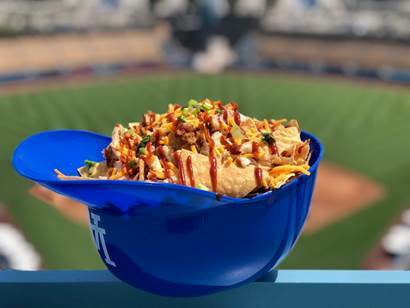 First, in honor of Atlanta you can get the Smoked BBQ Chicken Nachos which features Slow and low smoked chicken, smothered in house made sweet smokey barbecue sauce, served on top of triangle cut nacho chips, topped with green onions and cheddar cheese. The third food item honoring San Francisco series is an Turkey Pastrami Gravy Fries featuring crispy french fries, tossed in gourmet sea salt, topped with turkey pastrami, brown gravy and chopped parsley.